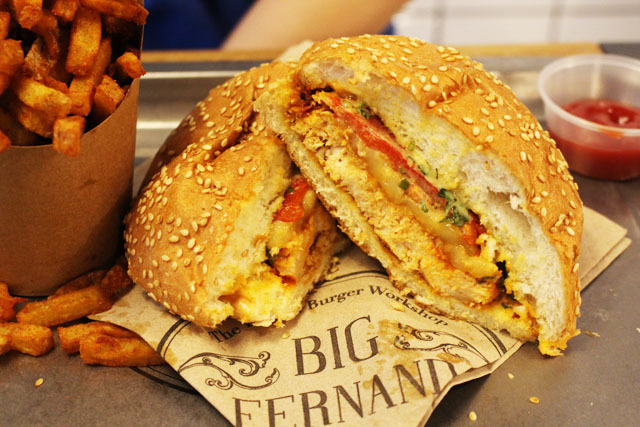 Very interestingly, Big Fernand is opened by three young French men, Alexandre Auriac, Steve Burggraf and Guillaume Pagliano, who come from different backgrounds and met as they were planning to produce hidden camera jokes for TV and online broadcasting. 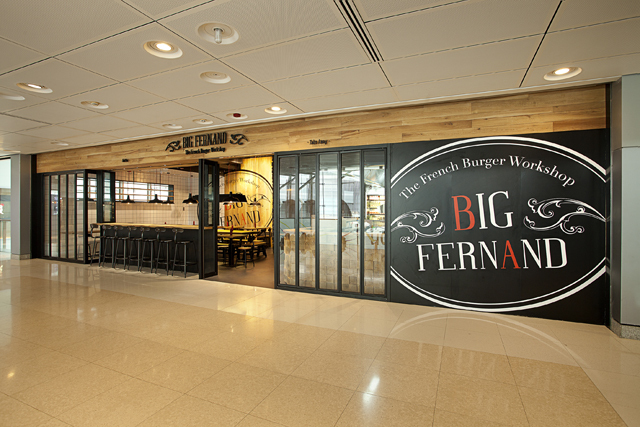 When the wave of American burgers hit Paris a few years ago, the trio decided to create their own series of gourmet French burgers and the first Big Fernand restaurant opened in January 2012 and has since then been very well received by the locals and tourists alike. The Hong Kong restaurant is located in IFC, and it is the restaurant chain’s first outlet outside of France, with an outlet to be opened soon in London. 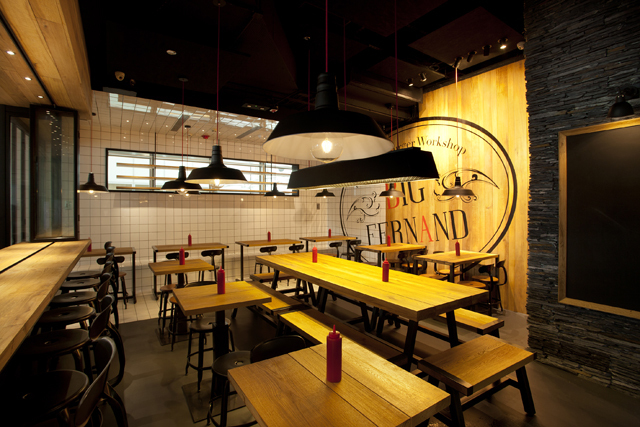 The restaurant, with its wooden tabletops, metal stools and retro lamps, exudes an industrial-chic, welcoming vibe. 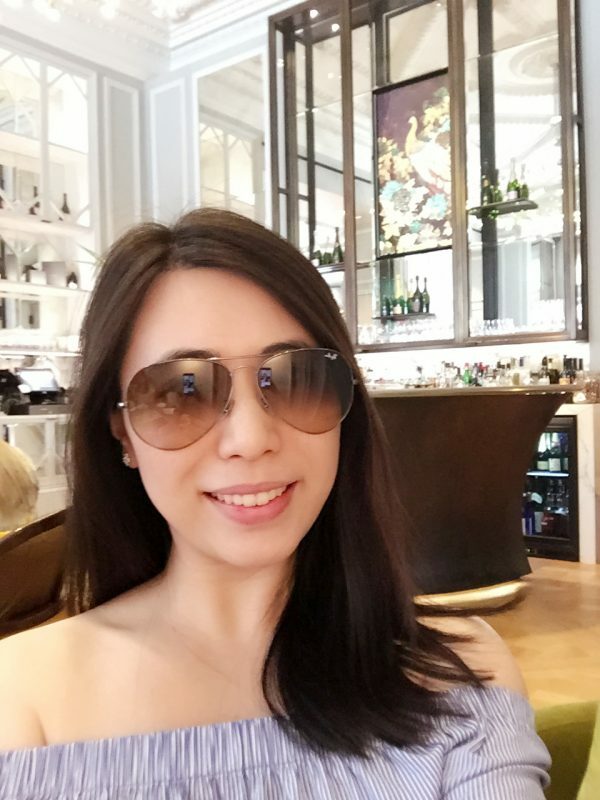 When we go there during weekday lunchtime, the restaurant is very packed with a long queue outside, but it is generally less busy for dinner. 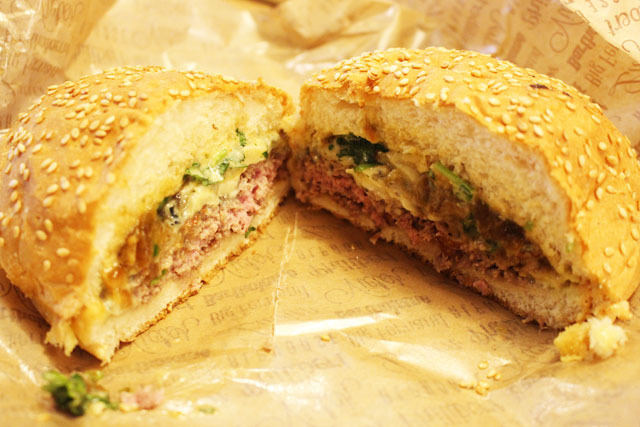 The offerings are American burgers with a Parisian twist. The restaurant only uses the best quality and freshest ingredients in its burgers, from Australian graded, pasture fed, hormone- and antibiotics-free beef, to fine French cheeses made with raw milk. You can either order the restaurant’s signature burgers, or build your own burger by choosing the meat (beef, chicken, veal, lamb and veggie), cheeses, vegetables, home-made secret sauces and fresh herbs and spices. (1) Before our burgers arrive, we decide to try the signature traditional lemonades ($40), which are manufactured in France exclusively for the restaurant chain. 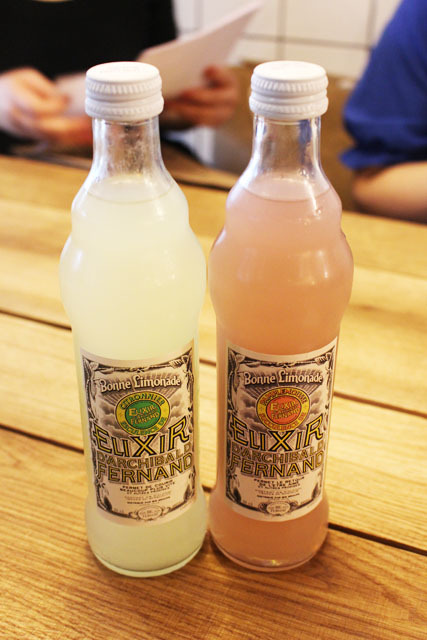 There are three flavours, Nature, Lemon and Grapefruit, and they are incredibly refreshing and are fantastic to go with the burgers. (2) You can order any burger, and add $40 for French fries and a drink, or add $70 for French fries, a drink and a dessert (the desserts are not yet available this week but I hear they are coming soon). We order a few burgers to share, and start with the lightest one, “Le Philibert” ($120). The fillings are a piece of seasoned chicken filet, Tomme de Savoie cheese and grilled peppers, dressed in a secret home-made sweet mayonnaise that they call “Tonton Fernand” and sprinkled with tarragon. The chicken filet is well seasoned and tender, and the home-made mayonnaise tastes complex and delicious. Their “Fernandines“, French fries that are freshly prepared from scratch in-house and sprinkled with their secret seasoning, are moreish. Note that these fries are in an orange shade and are not as crispy as the American ones. (3) Next, we go for “Le Victor” ($130), which is a lighter beef burger with Australian veal, Fourme d’Ambert and caramelised onions, also in a Tonton Fernand sauce and sprinkled with coriander. I adore the delicate taste of the veal, and find the creamy blue cheese an utterly delightful match with the beef. However, one of us seems to find the blue cheese a tad too pungent for the burger. (4) Lastly, we go for “Le Bartholome” ($135), filled with Australian beef, Raclette de Savoie cheese, bacon, caramelised onions and chives, in two sauces – “BB Fernand” (a secret home-made barbecue sauce) and “Tata Fernand” (a secret home-made cocktail sauce). This may sound like a heavy combination, but it is completely worthy of my stomach space – the beef is exquisitely juicy and flavourful, and the cheese adds a strong, magnificent kick. The two sauces are well-adjusted and completely delectable, and the bacon adds a beautiful crunch. 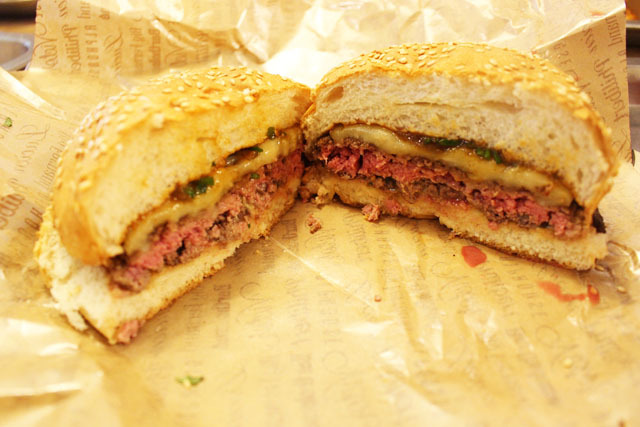 Some of my friends note that the burger patty is not quite thick enough, but personally I find it acceptable. All the burgers taste a little sweet thanks to the home-made sauces. The dessert menu is not yet ready at my visit, but apparently it will be available soon. The prices here are not cheap, but it is understandable given the restaurant’s prime location and the top shelf, imported ingredients that are used. Worth a try if you work near the IFC and are used to the hefty prices within this mall!